He's got some good points here...Will anyone with any sway in the decision making take notice? Not likely. 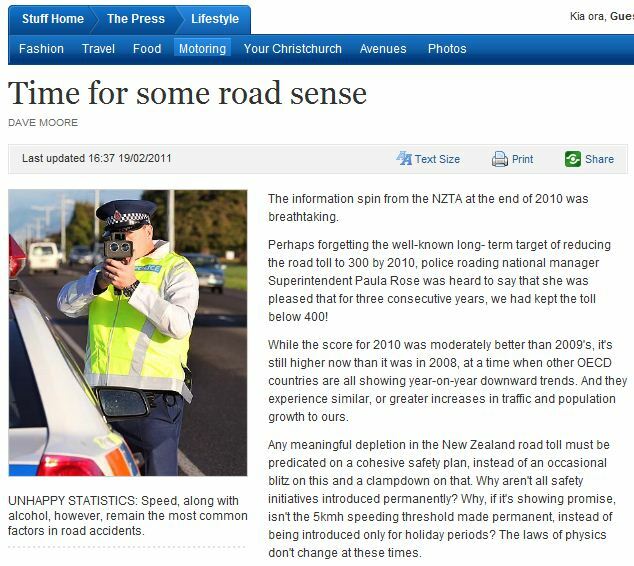 Seeing that overseas studies show that removing the open road speed limit entirely has the effect of lowering the road toll, I am unsure of the validity of the points there. So true, prior to Jan 1 2007 The NT had no speed limits on our highways. In 2007 speed limits were imposed- 130kms on one or 2 major highways and 110kph on all the others. Since then our road toll has sky rocketed. As a member who has worked at remote stations and who has attended at and investigated more than my fair share of fatal accidents it is apparent that overwhelmingly the accidents are single vehicle accidents which have wandered off the road, overcorrected and rolled. Fatigue and lack of experience with the conditions is the overwhelming cause of these accidents. The 1500km trip from Alice to Darwin used to be a pleasant 9 or 10 hour trip, leave when it is light and arrive when it is still light. Now you leave in the dark and arrive in the dark dodging everything from 'roos, camels, donkeys and buffalo which come out after dark. The facts don't lie and since we had speed limits introduced our road toll has gone up. Simple as that. This is interesting. I accept the facts about the road toll increasing since the introduction of speed limits; but on the surface it seems counter intuative. Slow people down and the accidents go up? Im curious about the mechanisms behind this, surely not all crash victims killed are dodging livestock on 1500km trips from Alice to Darwin. Or are they? Just wondering what else contributes to this trend. Maybe im too indoctrinated in the "speed kills" mentality but it seems every accident report you read in the paper the police say "speed was a factor". I understand that in NT the roads are long and straight so falling asleep and kangaroos are big issues, Would the same trend be expected in NZ where the trips are probably way shorter and the roads not so straight? Fatigue is a huge factor, you're right the long straight roads here are a factor and the fact that many of the fatalities on the open roads are foreigners from Europe where driving conditions are considerably different is significant. From my own perspective, I know that when I have the cruise control set to 160 or 170 kph I am far more focussed about what is going on ahead of me than when I am cruising at 110 kph zzzzzzzzz. Cars these days are made for it. We have a Mazda 6 which absolutely purrs along at 160/170 and uses bugger all fuel at these speeds. You arrive awake and refreshed at your destination. Mind you when I lived in NZ I was disappointed when I couldn't cover the 428kms between Nelson and Chch in 3 hours or less. On one trip I literally didn't see another car from Richmond to Belfast!! Open Road speed limits don't save lives in my opinion. They're just a revenue grabber and symptomatic of the nanny states that we now live in where every moment of your waking and sleeping life is controlled by the fun nazis. I suspect that many accidents are caused by impatient drivers overtaking in innapropriate places. Speaking personally, I would be content to sit behind a slow moving vehicle if I knew that I could make up the lost time once it was safe to pass. Another cause I would suspect, is holding ones speed in innapropriate places in an attempt to keep the trip time down. Once again, if one could increase ones speed to whatever one is comfortable with once through say, a windy section of road, I would be quite happy to travel at a slower pace through it. Whatever - Its been proven to work. Aside from all the arguable points above, speed IS ALWAYS a factor in any crash. Would the crash have happened if the parties involved were doing 20-30kmh? Completely ridiculous to drive at this speed I know, but it is a factor. Would there have been the same fatal or serious injuries in the crash if the parties had been travelling at 20-30kmh? Nope. I know it's ridiculous, but there you go. Would it have happened if the driver had decided to stay home? The point is, fatalities drop when the open road limit is removed. In the case of Montana, 5%. Doesnt sound much, but view it as 5 people in every hundred and it becomes worthwhile. In fact, any drop in the road toll is worthwhile. It is equally as obvious that fewer vehicles crash when the limit is removed.